Using sound waves, a Vascular Ultrasound exam looks at the blood flow in your veins and arteries. High-frequency sound waves are transmitted from a handheld device, called a probe or transducer, that is placed on the body and moved around the area of interest. A gel is applied to the skin to aid in the movement of the transducer. The transducer collects the sounds that bounce back and a computer then uses those sound waves to create an image on a computer screen. Ultrasound exams are noninvasive, don’t use radiation, and images are captured in real-time, showing the movement of your blood flowing through your blood vessels. Why would I need a Vascular Ultrasound? Locate and identify blockages and abnormalities. Detect blood clots in the major veins of the legs or arms. Determine whether a patient is a good candidate for a vascular procedure, such as angioplasty. Evaluate varicose veins, when referred by a specialist. Evaluating circulation helps determine if there is risk of a stroke or vascular disease. 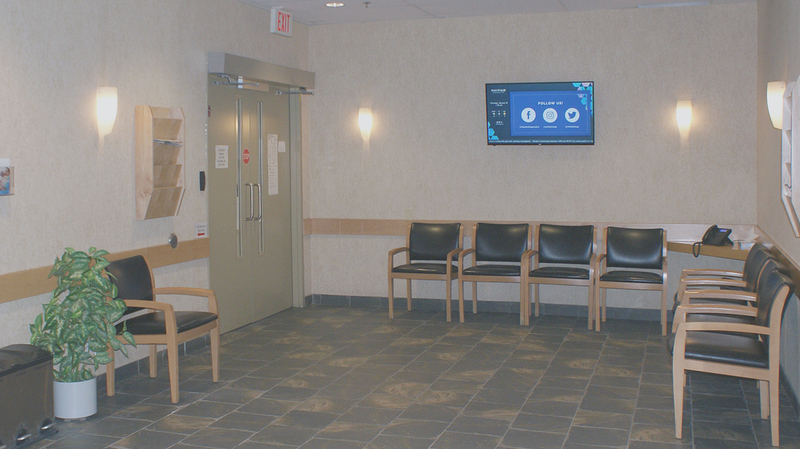 The most common exams are Venous (vein) Ultrasound of the leg or arm to check for blood clots and Carotid Artery Ultrasound to assess blood flow to the brain, which are performed at most Mayfair locations in Calgary. What happens during a Vascular Ultrasound? For some Mayfair Diagnostics’ Vascular Ultrasound exams, you will be asked to lie on your back and blood pressure cuffs will be place on both arms and both ankles. The blood pressure cuffs will inflate so the sonographer can take blood pressure readings. The cuffs may become tight, but only for a few seconds. Other exams don’t require cuffs, the transducer will simply be passed over the area of concern. During the exam your sonographer will listen to your blood flow, so you may hear what sounds like your heartbeat. This is the blood moving through the blood vessel and each blood vessel checked has a slightly different sound. A warm, non-scented, hypo-allergenic ultrasound gel will be applied to the area being scanned and a series of images will be acquired to show the structure and flow of blood through the blood vessels. Depending on the type of exam, you may be asked to move your arms, lie on your side, sit, or stand to help acquire the best images of the area in question. Exams can range from 30 minutes to one hour depending on their complexity. Please visit the Vascular Ultrasound services page for information on specific exams. 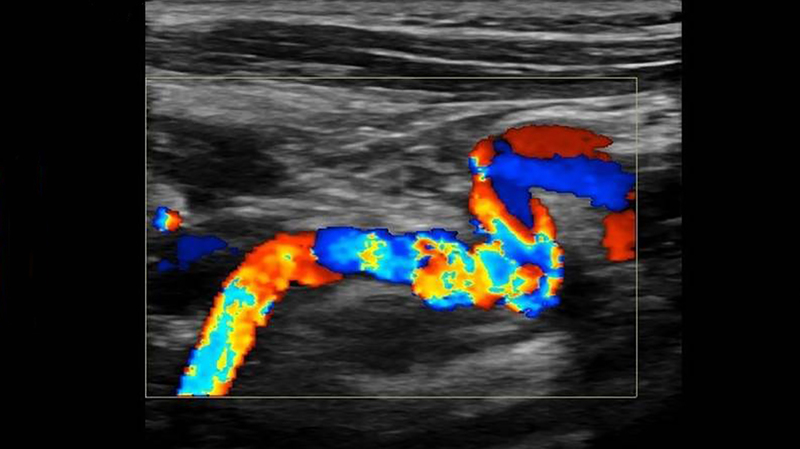 What happens after a Vascular Ultrasound? After your exam a specialized radiologist will review your images and interpret them before forwarding a report to your referring physician. If there are any concerns with your results, a radiologist may speak with you or fax a report to your doctor. For non-urgent results, your doctor will receive a detailed report, which will outline your diagnosis, by the next business day following your exam. Your doctor will then discuss your results with you. Are there risks associated with a Vascular Ultrasound? Ultrasound is non-invasive and safe. Occasionally, an ultrasound exam may require pressure to ensure the best image of the area in question and may be temporarily uncomfortable, such as when an area of tenderness is scanned. As well, during a Venous Ultrasound the transducer will be pressed against your leg to cause the veins to squeeze closed momentarily. This is not harmful to the vein, but it is the preferred method of checking for a blood clot. The pressure may be quite uncomfortable for the few seconds it takes to evaluate each segment of the vein down the leg. 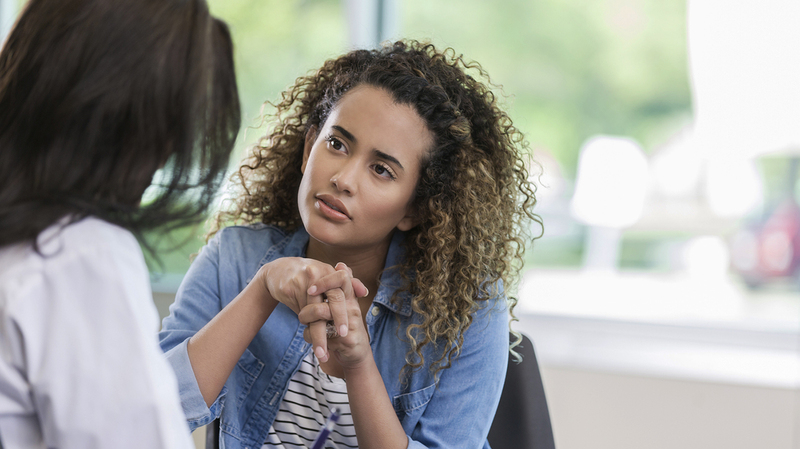 To determine whether a Vascular Ultrasound is right for you, it’s important to speak to your health care practitioner about your options. 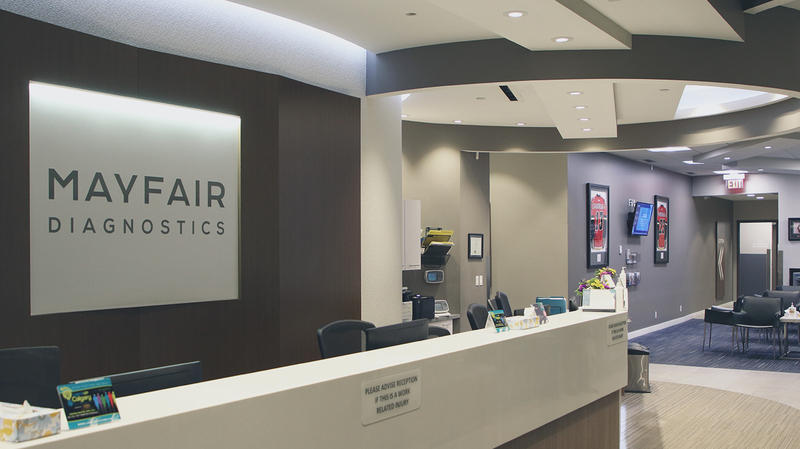 Venous and Carotid Artery Ultrasounds are performed at most Mayfair locations in Calgary, while the more complex procedures are performed at our Vascular Lab at our Mayfair Place location. RadiologyInfo.org (2018) Ultrasound – Vascular. www.radiologyinfo.org. Accessed August 27, 2018.